Posted on July 29, 2017 at 3:56 pm. 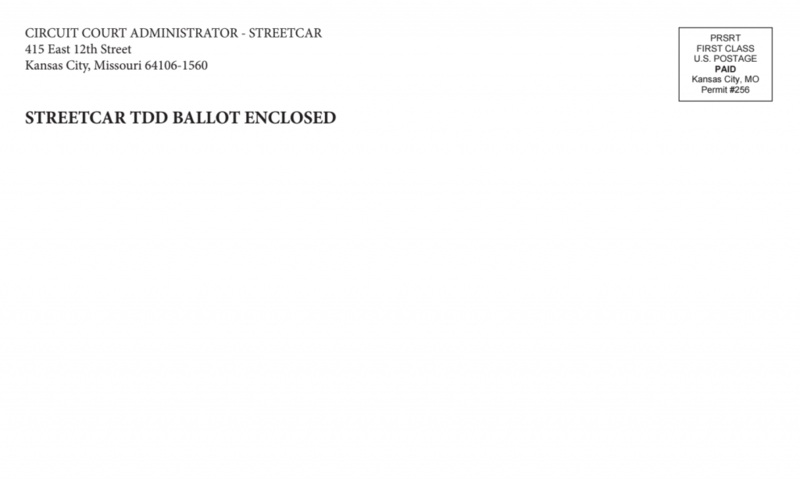 All ballots for the special mail-in election to extend the streetcar through Midtown to UMKC must be received at the 16th Circuit Court by 5 p.m. on Tuesday, August 1. Mail-in ballots in Missouri must be notarized. The Jackson County Clerk offers free notary services on the second floor of the Courthouse. Voters may return their ballots in person at the Circuit Court Administrator’s office on the third floor. Posted on June 23, 2017 at 9:52 pm. The Board of the Kansas City Regional Transit Alliance opposes Question 1 on the August 8 ballot in Kansas City, Missouri. While seeming just to require a citywide vote for streetcar expansion, the ballot language actually contains a provision to penalize “all City officers, agents, and employees” $1,000 per day for engaging in any planning or preparation for streetcar or fixed rail of any kind. This subversive threat to freedom of speech should be voted down. Creating such an impediment to the expansion of Kansas City’s transit network after the overwhelming success of the Downtown Streetcar makes no sense. While a citywide election may have merit, gagging public employees and elected officials with the threat of fines may be unconstitutional and expose the city to potential litigation. We encourage the voters of Kansas City to reject Question 1. The sample August 8 ballot is available here. Posted on May 16, 2017 at 1:51 pm. The May 23 deadline is quickly approaching for voters inside the proposed Transportation Development District to request a mail-in ballot to form the new streetcar funding district. Completed ballot applications must be received by 5 p.m. that day. It is suggested that applications sent at this late date be faxed or delivered by hand to the Circuit Court’s office. See https://www.16thcircuit.org/streetcar for instructions and a downloadable ballot application. If you know anyone with a mobility issue or without internet access, please contact the Circuit Court at 816-881-6671 for an accommodation. Additional information about the proposed streetcar extension to Midtown/UMKC is available at http://kcrta.org/streetcar. Posted on April 5, 2017 at 2:00 pm. A mail-in election is being conducted to fund an extension of the KC Streetcar from Union Station to the vicinity of the University of Kansas City – Volker Campus. The election will form a new Transportation Development District that will replace the existing downtown streetcar TDD. Check the new TDD map to ensure you reside inside the Proposed District Boundary (see legend). Mail-in ballot applications are due 5 p.m. on May 23, 2017. Ballots will be mailed to qualified voters on June 20, 2017. A Public Notice for the election also appears in today’s (April 5) Kansas City Star. Posted on March 24, 2017 at 6:18 pm. On April 4, voters in Kansas City, Missouri, will vote on three General Obligation bond questions to fund basic infrastructure projects over 20 years. The Kansas City Regional Transit Alliance encourages a yes vote on Question 1, which will fund a progressive sidewalk repair and construction program and the local match for Prospect MAX. Prospect MAX represents the third iteration of Kansas City’s innovative bus rapid transit system. Main Street was upgraded in 2005 and Troost Avenue in 2011, both to much fanfare and increased ridership. After a failed attempt to include Prospect MAX in the 2014 streetcar expansion program, it’s time for KC voters to commit financially to this high ridership — but economically stressed — corridor. The promise of new technology and a more intense focus on transit-oriented development makes Prospect a true evolution of the MAX brand. Question 1 will also provide up to $150 million in funding for sidewalk repair and construction throughout the city. A high quality sidewalk network provides critical access to the existing transit network. There are also many neighborhoods that have little to no sidewalk infrastructure, making transit service a challenge. We prefer not to have a cap on the amount of sidewalk spending, but spending on arterial road reconstruction should also provide a smoother ride for the RideKC fleet. KCRTA encourages a YES vote on KCMO Question 1 on April 4. Posted on February 25, 2017 at 2:51 pm. 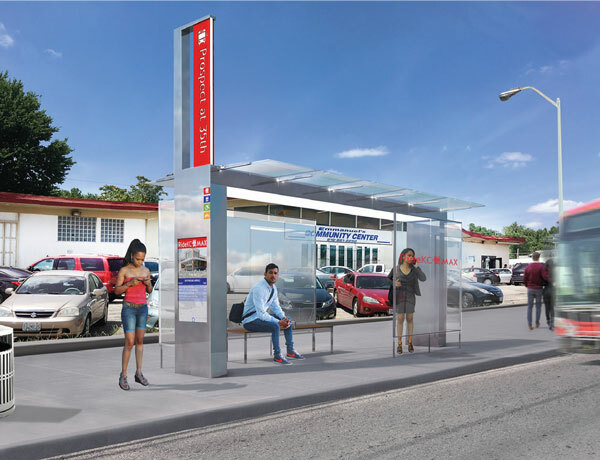 The window for applying to vote in the UMKC/Midtown streetcar mail-in election has been extended three weeks, due to the number of active voters expected to participate in the process. Registered voters who reside inside the Transportation Development District boundary may apply for a ballot as early as 8 a.m. on Wednesday, April 5, 2017. The deadline to apply for a ballot is 5 p.m. on Tuesday, May 23, 2017. Per state statute, voters must provide proof of voter registration that indicates they reside inside the proposed TDD boundary. The new TDD — which would eventually replace the downtown streetcar TDD — is approximately bound by the Missouri River on the north, Campbell Street on the east, State Line on the west, and 53rd Street on the south. The southern boundary mostly follows city streets, so please check this map to confirm your location. The full proposed schedule of elections is here. More information about the proposed streetcar extension is at http://kcrta.org/streetcar/.